"KayRich is thawin' out yooooo.....who got hot chocolate??? haha"
Ms. Jay:I lovvvvvvvvve hot chocolate and actually am enjoying my 3rd cup of the day. Williams-Sonoma has the best around! Now, you would think that I would pause and wonder to myself, why is she enjoying her THIRD cup of the DAY??? I had know idea what I was getting myself into. I mean, if you never experience any type of euphoria, you'll never know what you're missing. 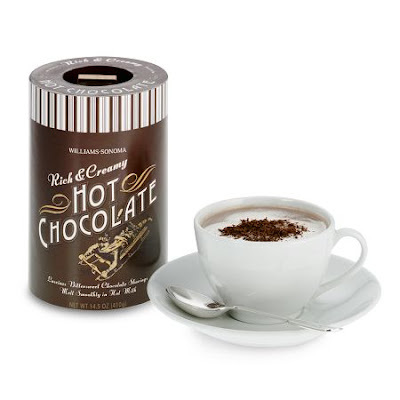 Well, I experienced my first cup of Williams-Sonoma Hot Chocolate, and oh man, whenever my budget forces me to go back to simple Swiss Mix Hot Chocolate, it will be like eating fat free peanut butter--I mean, you just cannot do that. It's so smooth, so creamy, so good til the last drop! And it's not just any chocolate mix, it's rich bittersweet chocolate--not any of that powder mix--but chocolate SHAVINGS! OMG It is like crack for my taste buds. Fortunately my original addiction to Twizzlers is in my budget, but oh man, when my chocolaty-goodness gift runs out, my taste buds will go into withdrawal symptoms of shock. Once I'm finally done with the school scene, I already know what I'll be drinking on cold days--and possibly hot--once I'm finally into my career.